The EASYDECK Ramp System provides easy access to tiered seating for wheel chairs, those with young children, or anyone finding stairs difficult. Easydeck ramps comply fully to ‘Document K’ of the UK building regulations. The ramp system is available in three height sections giving overall height increases of 250mm per section. These ramps, when used in combination with one another, give gentle slopes up to a maximum height of 750mm. This can be in either a single straight run or switchback when used with standard modules as landings. EASYDECK ramp modules can be supplied with optional handrails for added security. 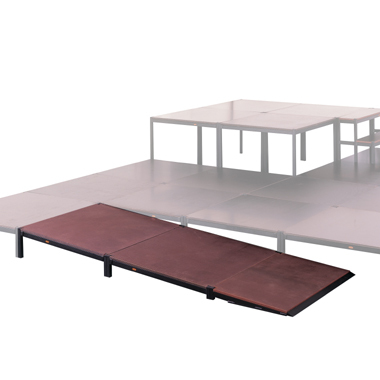 In common with standard modules, ramp units have a safe working load of 500 Kg per square metre, and a point load of 300 Kg.